The Edmonton Oilers have not made a post-season appearance since the 2005-2006 season, and with seven games remaining on the schedule, they must be eager to put another disappointing season behind them. In their last 10 games the Oilers have allowed 37 goals, while scoring a mere 22 of their own, and have failed to live up to expectations once again. Their system is filled with young talent, but as far as having a strong defensive core is concerned, Oilers management has failed to deliver. Since the 2007 NHL entry draft, the Oilers have selected seven high potential first round picks, though only two of them have been defensemen. They’ve gained the services of Sam Gagner, Jordan Eberle, Taylor Hall, Ryan Nugent-Hopkins, and Nail Yakupov, but no matter how much power you have up front, a team cannot score goals when they’re hemmed into their own zone. In the 2012 draft, eight of the top 10 picks were defenseman, though the Oilers selected right-winger Nail Yakupov first overall. However, in 111 games Yakupov has collected a meager 55 points, and is negative 37 on the season. To put that in perspective, Taylor Hall went first overall in 2010, and has collected 118 points in his last 113 games. A Yakupov trade for another youthful defenseman would be an intelligent managerial decision. But when you consider the Oilers current blue line, it makes you question the competence of the team’s head office. Rookies Oscar Klefbom (19 overall in 2011) and Martin Marincin (46 overall in 2010) – who have yet to play half an NHL season – have been paired with captain Andrew Ference, and veteran Jeff Petry to make up Edmonton’s top two defensive pairings. And while Justin Schultz may be considered one of Edmonton’s stronger defenseman, he is part of the third pairing alongside veteran Mark Fraser, who has one goal in his last 110 games. Combined, Edmonton’s top six defenseman have collected a sheer 71 points this season, and are an abysmal minus 73. As a result the Oilers have the leagues worst goals against average, giving up 3.28 goals-per game. 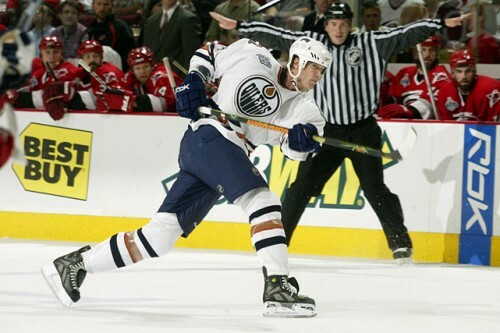 Edmonton has not had a strong shut down defenseman since Chris Pronger played in 2005-2006, which was the year the Oilers lost in game seven of the Stanley Cup final. However Darnell Nurse, the Oilers first round selection in 2013, may be just what the Oilers need to jump-start their defensive system. In his second OHL season with the Sault St. Marie Greyhounds, Nurse was plus 15, and garnered a very respectable 41 points. Entering this year’s draft, the Oilers would be wise to select another defenseman – namely Aaron Ekblad – who has 53 points in 58 games with the Barrie Colts, and is projected to be one of the top prospects of 2014. With an Ekblad selection, the Oilers would have three youthful, first round defenseman in their system, and would definitely be headed in the right direction. The Oilers are a young squad, with many pieces to a successful hockey team already in place. With the right moves, it’s only a matter of time until this underdog team becomes a serious contender, and other clubs had better be ready. This Oilers rebuild is far from over.